Folk from Bromsgrove and beyond flocked to the Finstall Open Gardens event, taking the opportunity to stroll around the pretty village, chat to friends and neighbours and visit the many diverse gardens on show. The event also incorporated a family Gnome Hunt, while further attractions included vintage cars, craft and plant stalls, displays of embroidery and paintings – and of course, delicious cream teas. All proceeds went to Finstall Village Hall, currently celebrating its 110th birthday. 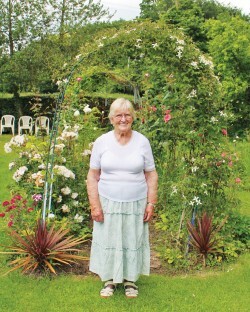 Above: Doreen Baylis in her cottage garden.